The Kimball ninth grade-and-under boys wrestled in the MNGWL Region 7 Individual Qualifier Saturday, Jan. 26, and faired very well. The Cubs took third place overall in a field of 17 teams and were the highest scoring team in class A.
Kimball’s Lucas Jurek, Ashton Hanan, and Carter Holtz earned the right to wrestle in state tournament action on Saturday. Results from the weekend: 113-pound Lucas Jurek wrestled extremely well. He gutted out an overtime victory in the semifinals and battled back for a true second place and the right to advance to state. 120-pound Brett Schiefelbein continues to impress and improve, finishing an impressive fourth in the tournament. 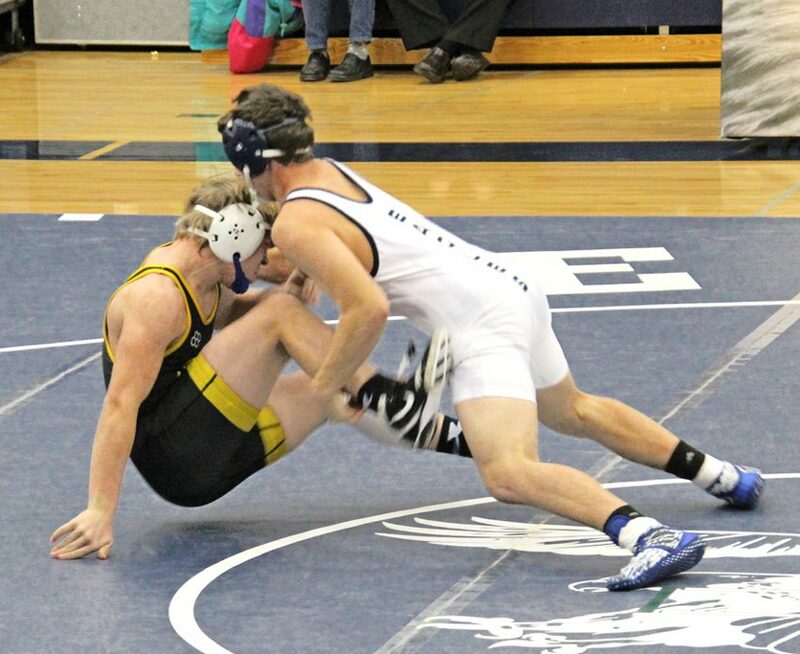 132-pound Cody Leither had a great tournament and he continues to show improvement and promise. He lost a tough one in the true second match to take third place. 160-pound Ashton Hanan dominated the field with three pins, on his way to a championship and the right to wrestle in the state tournament. 189-pound Carter Holtz picked up where “Shuggs” (Hanan) left off and capped off his dominant campaign with a 19-0 tech fall in the championship match. That earned him the right to represent Kimball in the state tournament on Saturday. 285-pound Ace Meyer battled and had some impressive wins. The future is bright for Ace. He finished fourth place over the weekend. Weekend Tournament Team Finishes: 1 Big Lake, 181.0; 2 Becker, 118.0; 3 Kimball, 115.5; 4 Foley, 104.5; 5 Princeton, 86.0; 6 Belgrade-Brooten-Elrosa, 81.5; 7 Pine City/Hinckley/Finlayson, 81.0; 8 Sauk Rapids-Rice, 75.0; 9 St Cloud Tech, 73.0; 10 Milaca, 70.0; 11 Eden Valley-Watkins, 66.5; 12 Paynesville, 60.0; 13 Sartell, 56.0; 14 Mora, 36.0; 15 Royalton, 32.0; 16 Holdingford, 31.5; 17 Pierz, 11.0. Ashton Hanan at 170# v Carter Mathies. Photo courtesy of DeeAnn Schueller.